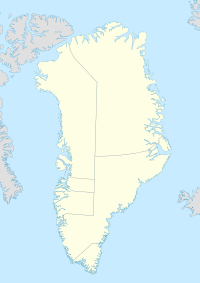 Qaanaaq (IPA: [qɑːnɑːq]), umwhile Thule or New Thule, is the main toun in the northren pairt o the Qaasuitsup municipality in northwastren Greenland. It is ane o the northrenmost touns in the warld. ↑ Greenland in Figures 2013 (PDF). Statistics Greenland. ISBN 978-87-986787-7-9. ISSN 1602-5709. Retrieved 6 September 2013.